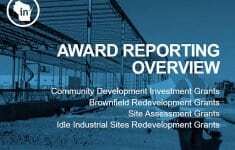 The goal of the Brownfield Site Assessment Grant (SAG) Program is to support community redevelopment in the state of Wisconsin. The program under § 238.133 Wis. Stats. provides grants of up to $150,000 to local governments seeking to redevelop sites with economic or community development potential that are or may be adversely impacted by environmental contamination. Grant funds are to be utilized to define the degree and extent of groundwater and soil contamination along with identifying and assessing vapor intrusion issues. “Eligible site or facility” means one or more contiguous industrial or commercial facilities or sites with common or multiple ownership that are abandoned, idle or underused, the expansion or redevelopment of which is adversely affected by actual or perceived environmental contamination. “Local government” means a city, village, town, county, redevelopment authority created under 66.1333, community development authority created under § 66.1333, or housing authority. “Petroleum product” has the meaning given in § 292.63(1). “Underground hazardous substance storage tank system” means an underground storage tank used for storing a hazardous substance other than a petroleum product together with any on-site integral piping or dispensing system with at least 10% of its total volume below the surface of the ground. “Underground petroleum product storage tank” has the meaning given in § 292.63(1)(i). The primary purpose of the Brownfield Site Assessment Grant Program is to identify and quantify the degree and extent of soil, vapor and groundwater contamination. Actual award amounts are dependent on documented eligible and matching costs. Projects seeking funding for demolition activities should demonstrate that clearing the site will facilitate and provide greater access for environmental site investigation. The property or properties being redeveloped must be one or more contiguous industrial or commercial facilities or sites that are abandoned, idle or underused. Potential expansion or redevelopment of the property is adversely impacted by actual or perceived contamination. The community has provided documentation it has access to the project site to conduct SAG activities. A financial commitment has been provided to cover the eligible matching project investment. Wis. Stat §238.133(7) requires the local government to contribute at least 20% of the grant. Due to program demand, generally WEDC requires that the local government’s eligible matching investment is at least 50 percent of the awarded grant, unless the project is located in a Designated Rural County, in which case the match may be reduced to 20 percent. Match investment may include TIF funds, private party contributions or other grant sources. The matching investment should include eligible costs and, at WEDC’s discretion, may also include acquisition costs. The incentives in this program are grants up to $150,000 per recipient per fiscal year (may be more than one grant but not exceeding the $150,000 threshold), or 15% of the available funds appropriated for the fiscal year,(11) whichever is less. Assist 13 communities and achieve a 2:1 leverage of other investment. Recipients will be required to annually submit a performance report documenting site work as well as any other contract deliverable. The SAG Program has a continuous application process. Applicants for a SAG should complete an application through a regional economic development director. The completed application will be assigned to an underwriter and go through the award review process. Learn more about the Site Assessment Grant Program. If you are interested in applying for or have questions about the Site Assessment Grant program, please contact your regional economic development director.